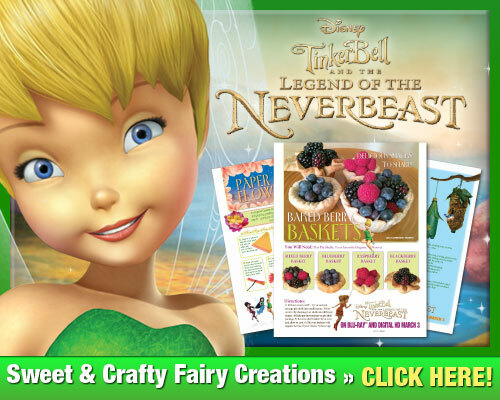 Tinker Bell and the Legend of the NeverBeast FREE Printable Activities and More! My girls LOVED this movie and I’ll admit I cried a little, too! Come out and smell the roses and pixie dust as today marks the first day of Spring! 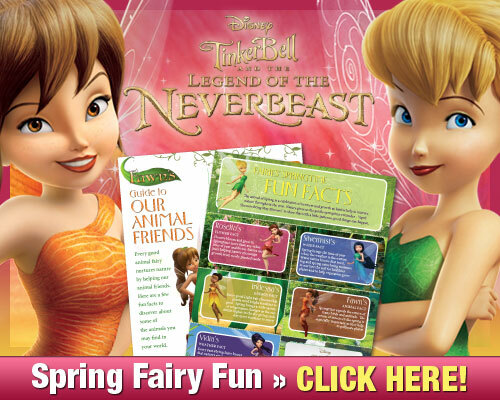 Your favorite fairies have gathered around to bring you some fun Spring Facts, character art and a bonus clip in honor of the recent release of Tinker Bell and the Legend of the NeverBeast now on Blu-ray, Digital HD and Disney Movies Anywhere! Disclosure- We received a copy of the title mentioned below to facilitate our review. All opinions are 100% our own. 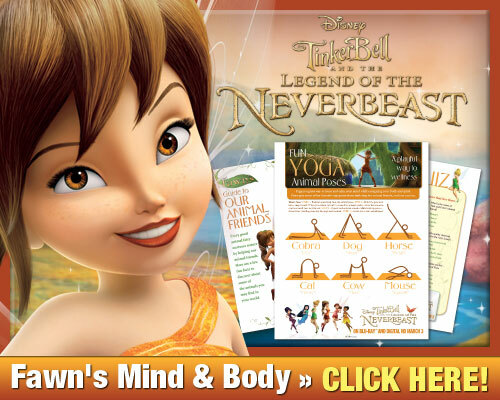 In honor of the release of Tinker Bell and the Legend of the NeverBeast now on Blu-ray, Digital HD and Disney Movies Anywhere here are some yoga animal inspired poses you and your family can do together along with a fairy quiz, and Fawn’s guide to animals. Don’t miss these Sweet and Crafty Fairy Creations, too! And Fairy Fun & Games! Here are some fun clips from the movie, too! Tinker Bell and Her Fairy Friends Return in a LEGENDARY New Adventure! 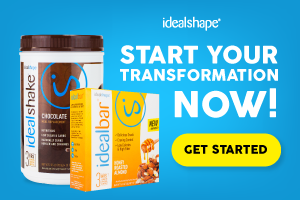 Disney Movies Anywhere, DVD & On-Demand March 3, 2015! Synopsis: Return to Pixie Hollow for the heartwarming and humorous adventure “Tinker Bell and the Legend of the NeverBeast”! An ancient myth of a fabled creature sparks the curiosity of Tinker Bell and her good friend Fawn, an animal fairy who’s not afraid to break the rules to help an animal in need. But this creature – massive and wondrous with glowing green eyes – is not welcome in Pixie Hollow – and the scout fairies are determined to capture the mysterious beast, who they fear will destroy their home. Fawn, who sees a tender heart beneath his gruff exterior, must convince Tink and her fairy friends to risk everything to rescue the NeverBeast. 5 Essential Ingredients to Getting Gruff: Uncover the 5 Essential Ingredients in making “Tinker Bell and the Legend of the NeverBeast.” The 5 ingredients are story, design, animation, sound, and making Gruff. My Dad’s Movie: The True Story of the NeverBeast: Director Steve Loter takes us on a personal journey of how his young daughter taught him life lessons that became the story for “Tinker Bell and the Legend of the NeverBeast”. Jeff Corwin’s Guide to Real-World NeverBeasts: From high above the trees to the darkest depths of the ocean, Jeff Corwin takes you on a wild adventure around the world where you will discover some creatures that actually exist in the real world. Tink’n About Animals: From a float of crocodiles to a mob of kangaroos, Fawn breaks down animal groupings by singing her own catchy song. Tinkerbell and the Legend of the NeverBeast is a great movie for the whole family. It is one of my daughters’ favorite new movies. In the beginning viewers might think that Gruff is going to be a big monster but in time we learn just how caring he is. It is unexpected and sure to make you shed a few tears so have some tissues handy. Yes, even you tough daddies out there! In the movie children learn not to judge by how someone or something looks without first learning truth. 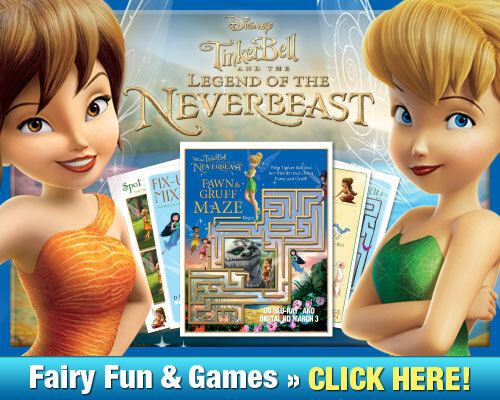 We don’t want to give too much away so grab your copy of Tinkerbell and the Legend of the NeverBeast today! 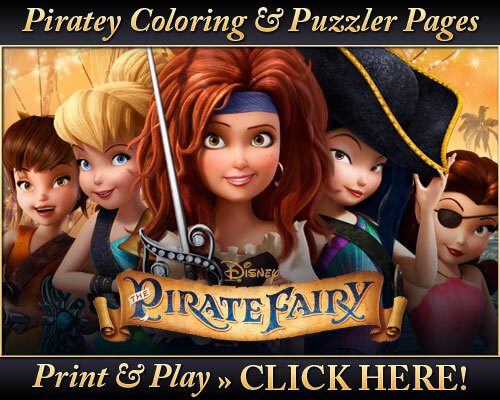 Disney’s The Pirate Fairy is one of my girls’ favorite movies! Check out the clip below from the Baby Croc featurette where writer/director Peggy Holmes explains how the filmmakers developed the character of Crocky. The find out more about crocodiles in a clip from the Crocu-mentary bonus feature! Then watch the film clip Tick-Tock Croc that is a nod to the part that Crocky plays in Peter Pan. The Pirate Fairy fun doesn’t stop there! Coloring pages and puzzlers can be downloaded from the button below! Burbank, Calif. – World Premiere of “The Pirate Fairy” with film talent (L to R) Angela Bartys, Pamela Adlon, Tinker Bell, Mae Whitman, Carlos Ponce and Christina Hendricks. March 22, 2014 Burbank, CA – Tinker Bell fluttered onto the red carpet at the World Premiere of Disney’s “The Pirate Fairy” at the Walt Disney Studios Lot. She was joined by film talent Christina Hendricks (Zarina), Mae Whitman (Tinker Bell), Carlos Ponce (Bonito), Angela Bartys (Fawn), Pamela Adlon (Vidia), Kari Wahlgren (Sweetpea), Natasha Bedingfield (sung original song “Who I Am”), Peggy Holmes (Director) and Jenni Magee Cook (Producer). Special guests included Samantha Harris (Dancing with the Stars), Ali Landry (Criminal Minds), Eva Bella (Frozen), Aubrey Anderson-Emmons (Modern Family), Maitland Ward (Rules of Engagement), TV personality Daphne Wayans, August Maturo (Girl Meets World) and Chloe Noelle (True Blood). The premiere of DisneyToon Studios animated adventure “The Pirate Fairy,” is executive produced by Academy Award® winner John Lasseter. The all-new swashbuckling film from the latest Tinker Bell adventure comes, The Pirate Fairy,which follows a smart and ambitious dust-keeper fairy named Zarina who’s captivated by Blue Pixie Dust and its endless possibilities. When her wild ideas get her into trouble, she flees Pixie Hollow and joins forces with the scheming pirates of Skull Rock, who make her caption of their ship. Tinker Bell and her friends embark on an epic adventure to find Zarina, and together they go sword-to-sword with the band of pirates led by a cabin boy named James, who’ll soon be known as Captain Hook himself. With laughter, heart, magic and thrills, “The Pirate Fairy” sets sailApril 1st on Blu-ray ™ and Digital HD. Have a Disney’s Fairies Fan or a Club Penguin Fan? Play For FREE! Join the Fun!!! My girls love both of these sites! 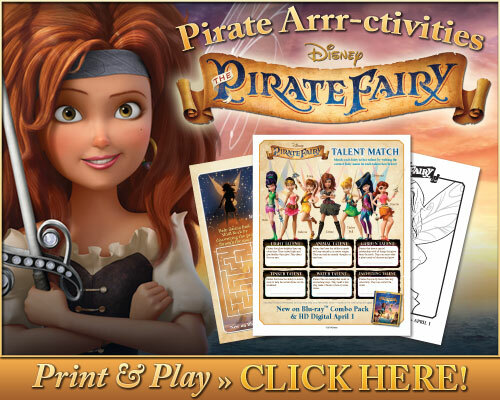 Check out Pixie Hollow, create a fairy, and fly! Adopt your perfect pet in Club Penguin!